Is America now caught like a deer in the headlights staring at one “lockdown” event after another not knowing what to do? Or is everyone happy that lockdowns are happening so that the government can keep you safe? Are we not paying attention to what is slowly becoming the greatest freedom crisis ever in American history where every day is now 9/11? What's missing now is an idea for a revolution against “lockdown” to declare it illegal and unconstitutional once and for all. Until this idea catches fire we are all in for some very dark days. I came across a story this weekend about a shooting that took place at a Denver Colorado motorcycle expo between potentially 2 rival motorcycle gangs. The report was not conclusive about who the people involved in the shooting were. The mass media reported that there was one person killed and at least seven others wounded. It was a fight that ended ugly. For bikers and members on both side it was likely very emotional and very tense situation that at least for now had ended. Unlike the typical modern day often scripted mass shootings, there was no search for a gunman or suspects on the run who no one can see or confirm their identity until long after they are announced dead by the police and mainstream media. There were no patsies for the police to hunt down then murder. No sharpshooters taking aim at random people and no disgruntled shooters on the loose. Despite the missing elements that would normally make this a mass shooting or a “terrorism” relate event, despite the missing “domestic extremists” element, the crazed lone shooter on psych medications and despite the missing “ISIS” component, we heard the term “lockdown” used; a word describing a police tactic that until just a few years ago was reserved for special situations. The fact of the matter is that in America today, (as I have been writing about lately) with every passing week, “lockdown” is increasingly becoming a very common tactic, and this should concern all Americans. According to reports surrounding this latest shooting incident, the hospital where some of the wounded men were treated was immediately put into “lockdown”, meaning innocent people were immediately placed on temporary in-house arrest without being allowed to leave. 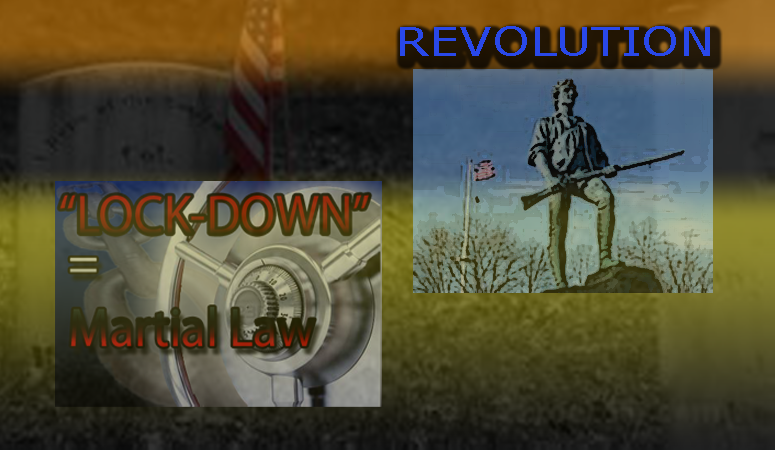 Sooner or later Americans will have to take a stand against lockdown because lockdown is tyranny and lockdown is martial law and neither has any place in America. As I've said many times, the idea of “lockdown” was mostly introduced in 2013, primarily via two events that occurred just a few months apart. In February 2013, the Chris Dorner manhunt was nothing more than a planned assassination, then in April of 2013 we had the Boston bombing aftermath where they officially and boldly rolled out “lockdown” to the national audience. The control system has not looked back since. These activists it seems don't exist yet because we (America) are being fully conditioned to accept tyranny by the day. No one is even realizing that this past week is one of the first times if not the first time we're hearing the term lockdown used more than once in one week in America. It was just a couple of months ago when the mass media used lockdown in Paris and then a few days later in Belgium to describe their “international manhunt”. Will your neighborhood be “locked down” tomorrow? There isn't anyone reading this article that can confidently say no, and that is serious cause for concern. It's time to face the tyrannical reality America is in. They sold “lockdown” to Americans when no one was looking and everyone bought it. No one complained, no one thought it was odd, no one questioned it, and now martial law lockdown is here. Millions of Americans should have taken to the streets after Boston bombing demanding justice for the people of Watertown, Massachusetts but no one did. Millions should have taken up the cause of justice on behalf of Chris Dorner's tyrannical manhunt but no one did. And we all watched in 2005 as FEMA approved the unconstitutional invasion of American homes following hurricane Katrina in 2005. All of these events were leading to one thing: introduction of martial law in America. Now it seems too late. Martial law is apparently here. After you read this article and as you sleep tonight, realize that the police can declare lockdown in your neighborhood and there is nothing you can do to stop this. No one apparently saw this coming, no one protested, no one stopped it and no one took action. So now we all have to deal with this new reality. So let me be the first to suggest that it's time to raise awareness, make noise and draft legislation in your town to STOP lockdown dead in its track. Start thinking of how and when you want to take action, how you want to word your letters to your elected officials and what you want to say in your city council meetings, but start doing it. Otherwise, realize that your home is no longer a safe place from government. Realize that the Constitutional protection you thought you had against illegal search and seizure is one lockdown away from going up in smoke. Which means that you are ONE crisis actor staged event away from having police enter your home. Realize that you are one false flag event away from having police rummage through your home at will. Think about that! More importantly, realize that it's time to end lockdown. Understand that America did just fine before lockdowns began and it will do just fine after lockdown is completely abolished and ruled uncontitutional. I want to be part of the revolution to abolish lockdown, don't you? If revolution today starts with the freedom to spread revolutionary ideas then let me suggest this idea. Let's abolish lockdown before it's too late. It's time to take a stand against lockdown in your local community. Let's challenge our local community leaders to demand that local and federal police prove to us the effectiveness and purpose of their lockdowns and how they make America safer. Let's challenge them to give us one example when lockdown was effective. It's time to force “lockdown” itself into the court system for its day in court. Picture an America and a world without lockdown. Recall the days when police went about their business of searching and arresting suspects based on the information they had, and when their failure to capture wanted suspects was dealt with by implementing standard police investigation operations. We saw these police investigation techniques in every cop TV show growing up. What we're seeing now is a lust and obsession to want to catch every suspect dead or alive now or never. We're told that all of life must stop until their suspect is apprehended or as we commonly see today, murdered. We've put such a high value of importance on police searches that we've relinquished our rights to them and bowed at their alter. This police worship has now come at the highest price possible, costing us all our natural born rights and freedom from tyranny and illegal government searches and quartering in violation of the third and fourth amendment. Lockdown has forced me to change how I think. It really hits home when you think of the possibilities of what could happen at any moment and it forces me to re-evaluate what my priorities are when it comes to activism. For anyone who thinks this issue is no big deal or that we can't stop lockdowns so we might as well accept it, I want to challenge you to show me any other government action that is immediately more threatening than lockdown. Lockdown is equivalent to having someone point a loaded gun your head in real-time. When it's happening, all of a sudden nothing else matters. Once lockdown begins, you are it. During lockdown you could be mistaken for someone else as occurred in the Chris Dorner assassination manhunt and your words and actions could be misconstrued in a different way. During lockdown you could more readily be accused of resisting; and if you are a gun owner attempting to protect your home not realizing what is happening, all your rights just went out the window and you could pay for this misunderstanding with your life or jail time. Will America and humanity around the globe stand up to lockdown or do we not have the will? What does your local community think about the morality, legality and Constitutionality of lockdown? Has the issue been brought up yet? Does anyone have the courage to push back on the police state? Now is the time for action if you care about freedom. If you agree please share this message.